I love stuffed peppers but for the convenience of reheating and sending for Charles’ lunch making stuff is so much easier. It’s quick and easy prep and it will reheat beautifully when he has his lunch tomorrow. I vary this recipe sometimes and simply use spaghetti sauce, but with all these fresh garden vegetables and herbs I decided to use fresh tomatoes, basil, and oregano instead of opening a jar. In large skillet over medium heat begin cooking ground beef. Add garlic and onions and cook until meat in no longer pink about 7 minutes. Drain fat from beef and return to skillet. Add peppers, tomatoes, and all spices and herbs besides basil. Bring to simmer and cook for about 10 – 15 minutes. 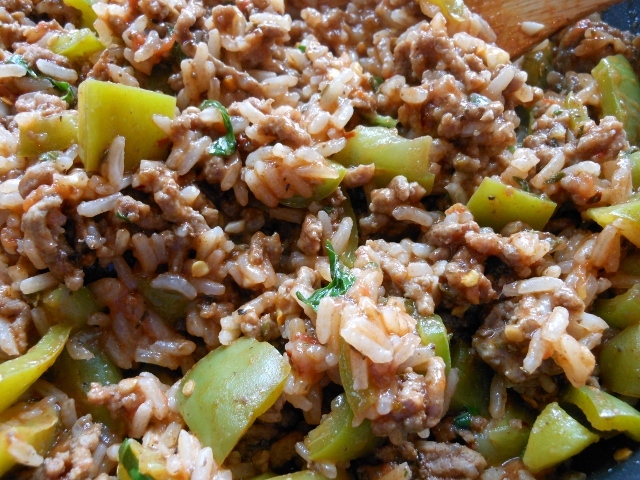 Stir in basil and cooked rice; heat through.